A lot of people ask me why using a CRT monitor or CRT television to play Arcade games instead of a new and powerful OLED or LCD 4K is a must. Why can’t you use a LCD display to benefit from the graphic of old arcade games? Thanks to CEV2TV video converter I could play some arcade games on both CRT monitor and LCD monitor at native resolution, with a scanning frequency of 15kHz and with no digital processing. In other words I play the games exactly at the same resolution supposed by the programmers during the code development. 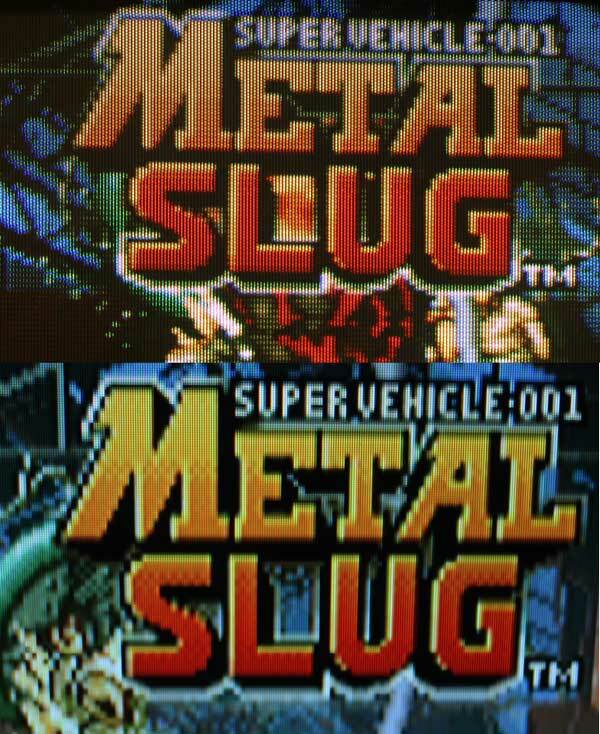 I can already say that the difference in video quality between a game played on CRT monitor or LCD monitor is quite an abyss. The difference is not only observable from arcades’ enthusiasts but from everyone, too. The different video quality is observable by playing a video arcade as well as watching a Windows desktop at 15kHz or working through the GUI realized in CGA/EGA of an industrial machine. It’s not easy to show the difference between CRT and LCD with a photo. The camera is not capable to show what the eyes are able to see and I confirm that the difference is greater than the one shown in the photos. To make the test I used a CRT television and a LCD television placed side by side and connected to the CEV2TV board through SCART connectors. I have calibrated LCD and CRT television with similiar brightness, color and contrast. 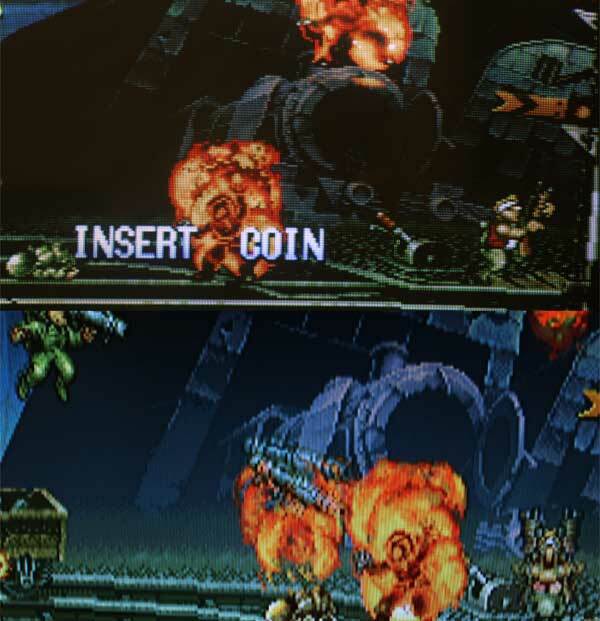 I used one of my favourite arcade games during the test: Metal Slug. 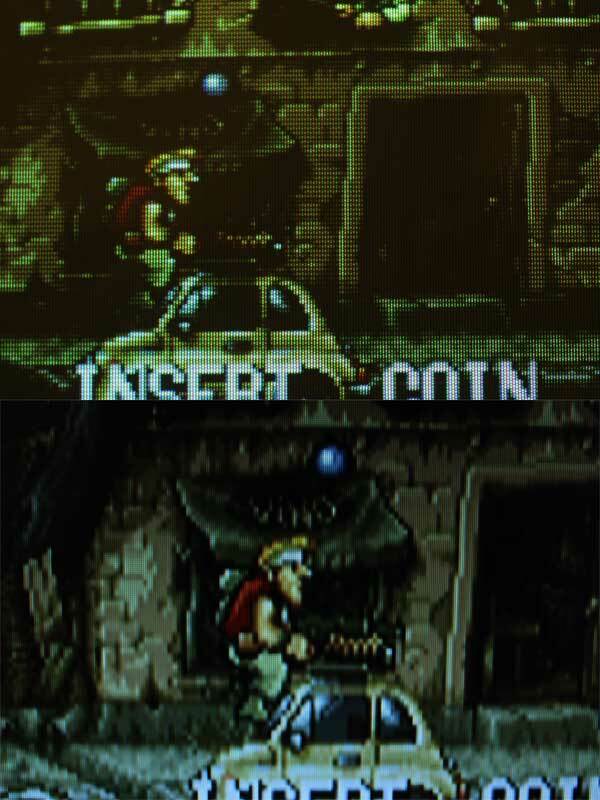 As the photos show, the colors and the details of Metal Slug displayed on CRT television are the best. Why is there so much difference (maybe in photos it’s not so huge) in video quality between CRT and LCD television? The answer is very simple: arcade games or CGA/EGA games were developed to be displayed on CRT monitor usually at 15kHz, therefore color and resolution are optimized for CRT monitor and nothing else. 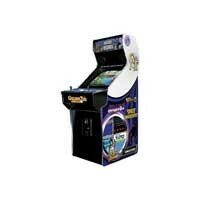 Arcade games or CGA/EGA games have a typical resolution of 320x288px with horizontal scanning frequency of 15kHz while LCD televisions or monitors have a resolution of 640x480px minimum. Thus, the video at 320x288px must be scaled at the resolution of the LCD display. As you can easily imagine, the digital process of image scaling “destroys” the original video signal and produces a low quality version of the original. Moreover, the colors produced by a CRT monitor are not equal to those produced by a LCD display. The same video quality “destruction” occurs when video converters able to convert from CGA/EGA 15kHz to VGA/HDMI/DVI are used. This type of video converters uses an Analog to Digital Converter (ADC) to digitize the video, so thanks to an image processing IC it scales (upscales) the video and then the digital samples are converted in analog with an (Digital to Analog Converter) DAC. With this type of conversion, the original video signals are only a memory. I think you mixed up pictures. The image above is inferior to the bottom which are lcd according to you. If this is true than lcd better? The pictures aren’t inverted. The game on the CRT monitor (the first photo in every picture) is better than on LCD. Unfortunately this photos aren’t so good to show this difference.